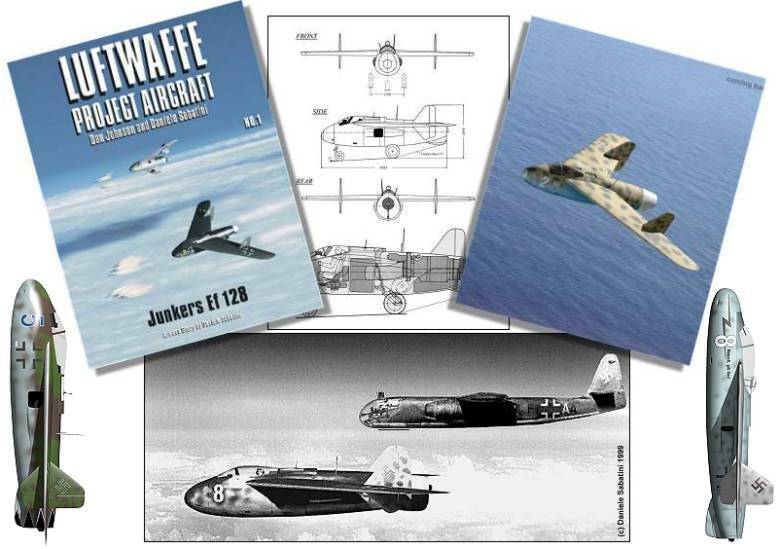 Note: The Ju EF128 booklet is now sold out. Thanks to all who made this booklet a success! This is the first in a series (hopefully) of booklets on individual aircraft projects as seen in the webpages of Luft '46. (Day and Night fighters are both covered). Examples can be seen above from the booklet. **BONUS** a special surprise insert in each booklet!! The price is $15.95 each, payable in a check or Money Order in US funds. I have made arrangements for those who wish to pay by Credit Card (please note that in your email and I will send details), but I prefer checks or Money Orders please. Shipping in the US is $2.00 First Class, $3.20 Priority Mail. Please email me for your shipping amount if you are outside of the US. djohnson@visi.net and I will send you information on where to send your payment.